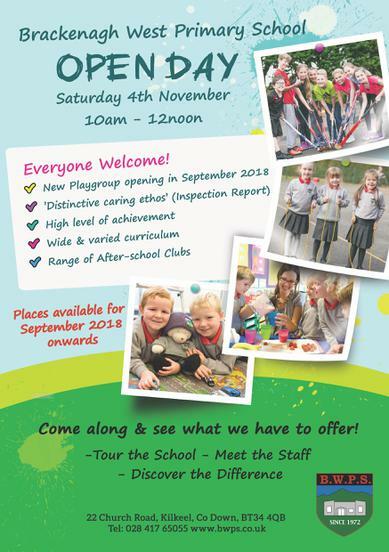 We plan to hold an Open Day on Saturday 4th November, from 10:00am - 12:00noon. This will be an opportunity for parents with a a child yet to start school a chance to view the school and meet the staff. Mr Peacock will be available to answer questions, and some of the children will also be there to let everyone see what we do in school. Refreshments will be served and the School Choir will be singing. This is for anyone in the Mourne district who might be interested in enrolling their child/children in Brackenagh West over the next few years. We also hope to use the Open Day to allow Dads to come and see the school, particularly those with children in P1 and P2 who may not have had the chance to come into school before.